This is a typical scenario when updating presentations to use new designs, templates, themes or just when you’re pasting slides from one deck to another. The slides come across with all of your lovingly created content but you need to change all the fonts to use those defined in your theme. 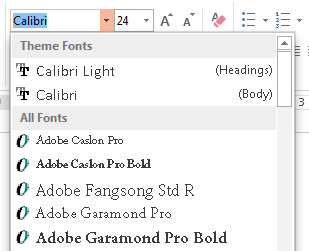 As a brief reminder, a Microsoft Office theme defines a pair of fonts; major and minor, or to put in another way for PowerPoint users, Headings and Body, as seen here on the right. 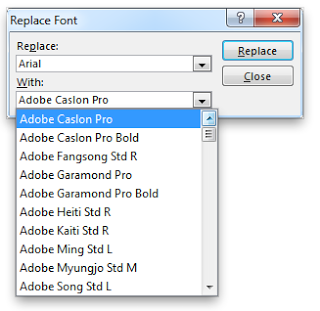 There is a font replacement tool built into PowerPoint 2013, 2010 and 2007 but it doesn’t allow you to change fonts to those defined in your theme. No way to choose theme fonts! This is a major issue if you want your slides to adapt to theme changes in the future, rather than manually selecting each and every object that contains text in your presentation and then setting the font to use one of the two defined by your theme. By setting every text object to use your theme defined fonts (instead of a direct named font), you can change the font for tens, hundreds or even thousands of objects across your presentation with one simple font change in your theme. But setting all your objects to use the theme font in the first place has to be done manually… or does it? Since PowerPoint doesn’t provide a way to replace a font with one specified by your theme, we need to add a macro to do this. 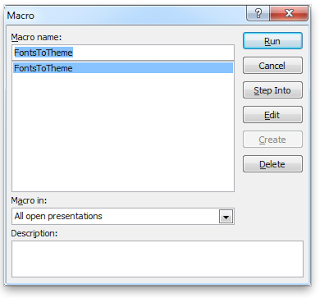 Macros are small bits of code that provide PowerPoint with instructions to do things and they are great for automating a repetitive task, exactly what we have here. *You may also want to enable the Developer tab in the PowerPoint ribbon if you can’t see it as it adds all the VBA tools you need. When done, see how much time you saved! 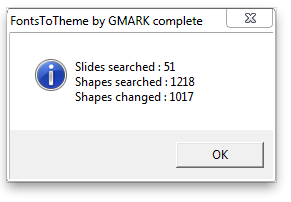 This macro searches through every slide of your presentation, looking for shapes or tables (within or outside of groups) that have text in them but are not title placeholders. When it finds something matching these criterion, it changes the font to the minor (Body) font defined by the theme. If it finds something it doesn’t know how to handle, it will show an error message. Once completed, it will show a brief message about what it changed. If you want to undo the change, simply go to your presentation and press Ctrl-Z. There are many different object types and scenari in PowerPoint and this macro has only been designed to handle the basics. It doesn’t know anything about charts for example so those won’t be changed. The macro may be used for free and/or modified, without license, as is. GMARK do not accept liability for any loss of data or damage as a result of using this free code.